The world's biggest heavy music touring festival, the ROCKSTAR ENERGY DRINK MAYHEM FESTIVAL, is celebrating its seventh year! As in year’s past, the festival is pleased to partner with charity program Metal of Honor. This year, Metal of Honor is proud to welcome back its partnership with iHome Audio, as well as welcome Second Stage sponsor COLDCOCK American Herbal Flavored Whiskey to the program. 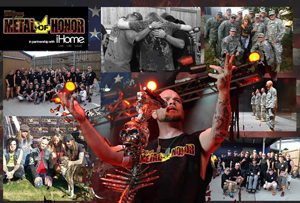 Metal Of Honor started in 2011 to raise awareness and financial support to a few key military non-profits while showing gratitude to our military men and women during the ROCKSTAR ENERGY DRINK MAYHEM FESTIVAL tour. This year’s Metal Of Honor charity program run will focus our efforts on two important charities: The Pathway Home (PTSD rehabilitation facility) and Hope For The Warriors (Military family assistance, veteran transition assistance, employment preparedness). With the help of the entire ROCKSTAR ENERGY DRINK MAYHEM FESTIVAL family, bands and sponsors, to date, Metal Of Honor has been able to raise over $150,000! This year, the ROCKSTAR ENERGY DRINK MAYHEM FESTIVAL will support Metal Of Honor in several ways, including exclusive VIP auctions with onstage and backstage access, VIP Guestlist donations at the box office at each tour stop, onsite raffles and auctions at the Metal Of Honor booth in the festival area, a post-tour online auction of stage used and signed instruments, cymbals, drumheads, equipment and set lists, and used cellphone donations. In addition to this support, a portion of all ticket sales from the festival will go towards Metal Of Honor. The Metal of Honor in partnership with iHome branded booth will be the central location each day out on the tour for these charity efforts. Next to the booth will be the custom wrapped ROCKSTAR ENERGY DRINK MAYHEM FESTIVAL / Metal of Honor wrapped tractor trailer featuring bold Metal Of Honor graphic art. The booth will feature Metal of Honor t-shirts and limited edition Zippo lighters for sale, a daily raffle drawing for either dinner backstage or a backstage tour, with the chance to win a ROCKSTAR ENERGY DRINK MAYHEM FESTIVAL artwork limited edition guitar hand signed by a collection of the tour’s artists. “Thank you gifts” to all donors, courtesy of Rockstar Energy Drink, along with handouts and literature from all our non-profits, will also be available, as well as iHome products. Lastly, all current military servicemen and women, along with veterans with military ID, will receive Metal of Honor silicone wristbands to designate attending military personnel. In addition, the IAVA (Iraq and Afghanistan Veterans of America) will have a representative with local hiring opportunities specifically for veterans located at the Metal of Honor tent at many stops on the tour. At each date, a Hometown Hero is celebrated for dedicating him or herself to our nation’s military service. This on- stage even is sponsored by iHome and COLDCOCK Whiskey. The festival and Metal Of Honor show gratitude for the Hometown Hero’s selfless service and dedication by bringing them up on the mainstage, in front of their family, friends, fellow servicemen and women and recognizing them and thanking them as the "COLDCOCK Whiskey Presents: the Metal of Honor, in partnership with iHome, Hometown Hero Of The Day". They'll receive a custom COLDCOCK Whiskey guitar, and a lucky person in the crowd proudly displaying their Metal of Honor bracelet will receive iHome products. We know many of our military men and women are avid motorcyclists! The ROCKSTAR ENERGY DRINK MAYHEM FESTIVAL is pleased to announce that Misfits Inc. has graciously donated a fantastic COLDCOCK American Herbal Flavored Whiskey- designed Misfits Motorcycle. 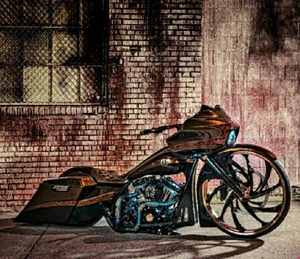 The motorcycle will be on display daily at the Metal Of Honor booth, featuring a hand-signed gas tank, John Hancock-ed by this year’s artists. The motorcycle will be featured on eBay starting in mid-August at: http://www.ebay.com/sch/merchant/unitetheunited and all sales will additionally support The Pathway Home and Hope for the Warriors. This year, Ride Across USA – a cycling group of veterans, family, and non-veterans – is riding on behalf of one of Hope for the Warriors, a Metal Of Honor charity mentioned above. The Ride Across USA team consists of seven cyclists and a SAG driver, riding to raise awareness and money for this great cause. To ride an average of 100 miles a day is ambitious for any age group, but for masters level cyclists the bar is raised a few notches. Ride Across USA departs from Topanga County Beach on June 4th and will complete the ride some 35 days later at Amelia Island, Florida. The goal for Ride Across USA is to raise $30,000 for Hope For The Warriors, and so far they’ve raised nearly $4,000. You can follow Ride Across USA via Twitter and Facebook, and learn more and donate at their website, www.RideAcrossUSA.com. Tickets for the ROCKSTAR ENERGY DRINK MAYHEM FESTIVAL are on sale now! This year’s odyssey will include four stages of heavy music and 20 bands. Also, look for Freestyle Motocross legend Jimmy Fitzpatrick and his FITZ ARMY of riders and a Motorsports exhibition area featuring Unknown Industries Harley Davidson Freestyle Riders, as well as many other surprises and attractions throughout the festival midway.